Again back to our scripts, the following script not only ceates users but also creates home folders and grant users permissions over their home folders. Also the home folder will be mapped will be mapped automatically to driver Z:. the following video shows how to use the script. In the following video i had granted the "Everyone" a full control over the "HomeDir$", this may be a security hole, so you can replace the "Everyone" by the "Authenticated Users" group and only give them the "change" and "read" permissions not the full control. Prior to Windows Server 2008, an Active Directory administrator was only able to configure a single Password Policy and Account Lockout Policy for any Active Directory domain. If you were faced with a subset of users whose password policy requirements were different, you were left with the choice of configuring a separate domain or forcing all users within the domain to conform to a single password policy. Beginning in Windows Server 2008, you can configure Fine-Grained Password Policies, which allow you to define multiple password policies within a single domain. • cn. The common name for the PSO, such as "ServiceAccountNoLockout." • msDS-PasswordSettingsPrecedence. In a case where multiple PSOs apply, this attribute of the PSO is used as a tie-breaker to determine which PSO should apply: a PSO with a precedence of 1 will be applied over a PSO with a precedence of 5, a PSO with a precedence of 10 will be applied over a PSO with a precedence of 100, and so on. • msDS-PasswordReversibleEncryptionEnabled. This attribute indicates whether the PSO allows passwords to be stored in Active Directory using reversible encryption. This setting should only be enabled if a particular application requires it, because it presents a significant security risk. Use “true” or “false”. • msDS-PasswordHistoryLength. This attribute indicates the number of passwords that Active Directory should retain in memory before allowing someone to reuse a previously used password. Setting this attribute to a value of "2," for example, would prevent someone from reusing the previous two passwords that they had configured for their user account. This setting corresponds to the Enforce Password History setting in Group Policy. • msDS-PasswordComplexityEnabled. This attribute indicates whether the PSO requires a complex password; that is, a password that uses a mixture of uppercase and lowercase letters, numbers, and symbols. The default password policy in Windows Server 2008 requires the use of complex passwords. • msDS-Minimum Password Length. This attribute indicates the minimum length of a password defined by this PSO. • msDS-MaximumPasswordLength. As the name indicates, this attribute identifies the maximum length of a password defined by this PSO. • msDS-MaximumPasswordAge. This attribute is a negative number that indicates in milliseconds when a password will expire. The default value is —36288000000000, or 42 days. • msDS-LockoutThreshold. This attribute indicates the number of bad login attempts permitted before an account is locked out. Days:Hours:Minutes:seconds, for example make it 2 minutes which is the default for the AD policy. • msDS-LockoutDuration. This attribute is a negative number expressed in milliseconds that indicates how long an account will remain locked out. A value of "0" indicates that the account will stay locked out until it is manually unlocked by an administrator. It should be entered in the form of: Days:Hours:Minutes:seconds, for example make it 2 minutes which is the default for the AD policy. 1. Are one or more PSOs assigned to the individual user account? If so, use the PSO that has the winning precedence. If not, continue to step 2. 2. Are one or more PSOs assigned to a group that has the user account as a member, either directly or through nested group membership? If so, use the PSO that has the winning precedence. If not, continue to step 3. 3. If PSOs are not assigned to the user or to any group that has the user as a member, apply the domain-wide password policy and account lockout requirements “Defined by Group Policy”. I have set the msDS-LockoutObservationWindow to 00:00:30:00 and the msDS-LockoutDuration value to 00:00:02:00.
the problem was that: The “msDS-LockoutObservationWindow” should not be longer than the “msDS LockoutDuration”. so to get out of this, i have set the tow values to 00:00:02:00, and it worked,thanks to Allah. "You must be granted the Allow log on through the Terminal Services Right"
You're seeing this error message because the user you're trying to log in as does not have the correct permissions to use Remote Desktop. To fix this, we'll grant these permissions to your user account. Note: Please be careful when following these steps, make sure you follow these steps as listed here. Right click Computer or My Computer and then click Properties. Click the Remote Settings link or the Remote tab if you are on XP. Click the Select Users or Select Remote Users button. If your user name is not listed in there, click Add and enter your user name. Click Ok and Ok again to dismiss both dialogs. Once you are done, try reconnecting. If you can connect, stop here - we're done. If you still see the error message continue to step 3. Click Start then click Run. Enter secpol.msc and click Ok. The Local Security Policy window should open up. Expand the Local Policies node and click User Rights Assignment. On the right hand side, double click Allow log on through Terminal Services or Allow log on through Remote Desktop Services. Click Add User or Group and enter Remote Desktop Users. Click Ok and Ok again to dismiss both dialog boxes. وصلي الله وسلم وبارك علي النبي وآله وصحبه وإخوانه وسلم. So, as the error message states, the CA-DC-01 which is the replication partner for GZ-DC-01 is not fully replicated with AL-DC-01 and this is because i have turned off AL-DC-01 to save some memory. Though after i have powered AL-DC-01 again the process of promoting GZ-DC-01 to the directory was successful, thank to Allah. Hope that has been ifnormative to you. Do you want to reinstall that domain? "Directory configuration information indicates that the domain child.mydomain.com already exists. Do you want to reinstall that domain? 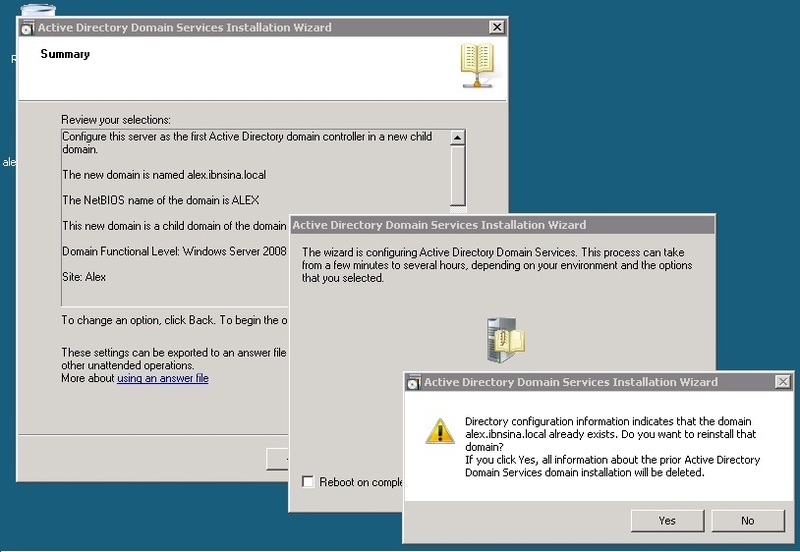 If you click Yes, all information about the prior Active Directory Domain Services domain installation will be deleted." some search on the internet for this problem i have seen som solutions but they did not work. "This problem occurs when you are using cloned virtual machines that have the same SID". I have mad a new virtual machine "clean installation" from the beginning. Finally thanks to Allah it worked. Solved: I Can Ping The DNS Server But I Can Not Resolve Names ! !! Solved: I Can Ping The DNS Server But I Can Not Resolve Names! 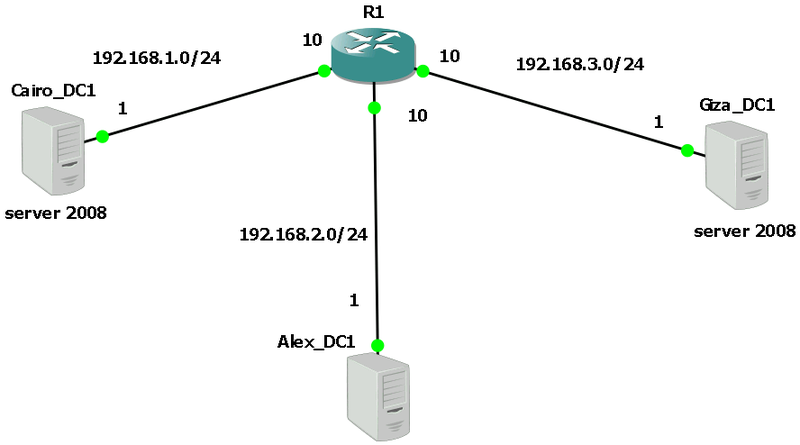 Consider the previous topology, i was creating a child domain in Alex, i have set the DNS in the network properties to use 192.168.1.1 which is the ip address of Cairo_DC, however i could ping the ip address but i couldn't resolve names consequently i could not promote the Alex_DC to the active directory. playing around this issue for sometime, i remembered that the ip helper address command used on Cisco router could also be used to forward traffic to DNS that is not located on the same subnet. As you know this command is used commonly for DHCP relay agent feature. And finally thanks to Allah it worked. wmic computersystem where name="Old_Name" call rename name="New_name"
If you see "1" in the script output, that means that RDP connections are denied. If you see a "0", they will be allowed.